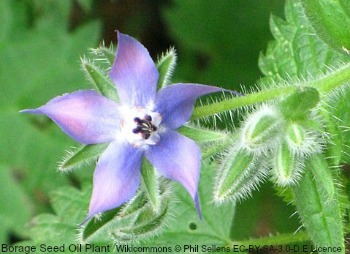 Borage seed oil, or borage oil, comes from the seeds of the borage plant. It's a tall plant with blue, star shaped flowers. Hence why, it is also known as starflower oil. It is found in most parts of the world. Borage oil has the most concentration of gamma-linoleic acid (GLA) of all the natural oils. GLA is an omega 6 fatty acid. It contains around 25% GLA. Because of the positive effect that GLA has on the skin it is logical to assume that borage oil would be a great natural treatment for eczema. GLA has anti-inflammatory properties that may help with the symptoms of eczema. There have been no official studies or reports that definitely say that borage oil is effective at treating eczema. Though as with all treatments, it may help one person but not be beneficial at all for someone else. There are a number of ways that borage oil can be taken or used. It is normally taken in capsule form. Capsules can be brought in different strengths. 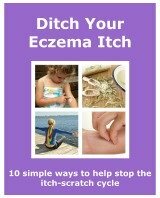 It is recommended that if you are taking them as part of your eczema treatment that you take 500mg or 1000mg daily. Borage oil can sometimes be used topically. Either directly on your skin, or mixed with your favourite moisturiser or carrier oil. If you want to use it directly on to your skin, or as part of a mixture, always do a skin patch test before using. Place a little of the oil on to a small area of skin. Leave it on for around 24 hours to see if there is any adverse reaction. If you decide to add some to a cream or lotion, or with a carrier oil, always mix well before you apply it to your skin. Borage oil side effects are very rare. It is a natural oil, and is extremely safe for adults and children to use and take. The only recommendation made is that pregnant women should not use or take borage oil. There have been some worries of it causing liver problems. because borage seeds contain toxins. Although the seeds are removed before the oil is used in commercial products so the risk is low. Borage seed oil is not the only natural oil high in GLA. Blackcurrant seed oil and evening primrose oil have a high concentration too. They maybe useful in the treatment of eczema, but are also definitely great for helping to keep your skin supple and moisturised. Any of these oils would be a great addition to your everyday skin regime.